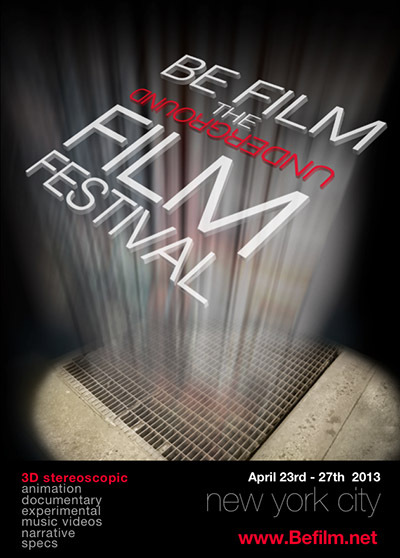 Be Film is back, and this year their 3D category is now accepting 48fps and 60fps HFR 3D films! I'm a big fan of Be Film, not only because they've premiered some of my own short films, but also because they were the first and remain one of the few mainstream short film festivals to play 3D films during the same screenings as 2D shorts, some of which have won Academy Awards. Returning sponsors include Dolby Production Services and Cyclopital 3D. See the full press release below. New York, NY (Feb 21) Be Film The Underground Film Festival-BTUFF announced Its dates for its 10th Edition: April 23 -27, 2013 Opening Night Party and Screening will take place at the prestigious Dolby Screening Room on 55th St & 6th Avenue Tuesday, April 23rd at 6:00pm. The 10th Annual Be Film The Underground Film Festival - BTUFF, continuing its lauded reputation as "the underground film festival" by honoring extraordinary short films and drawing them the exposure and circulation they richly deserve. Recognized by MovieMaker Magazine as one of "25 Film Festivals Worth the Entry Fee" and praised for its "focus on forward-thinking artists," BE FILM has presented more than 1,000 short films from more than 30 countries across the globe and regularly takes full advantage of some of the best screening and social venues in New York City. BE FILM welcomes terrific short-form works across all genres and creative forms, and it is proud to have been the first shorts festival in the world to introduce a "Stereoscopic 3D" category for filmmakers eager to stretch their craft into entirely new dimensions. Several of the festival's official selections have gone on to the highest levels of industry success and have nabbed Academy Awards, BAFTA awards, and Moliere Awards, as well as numerous additional honors. Just ask writer-director Ari Sandel, whose short musical comedy West Bank Story stole hearts at Be Film and then took home the gold on Oscar night. BE FILM winners take home prizes-ranging in value from $500 to $5000 USD-from a slew of generous sponsors. Energized opening and closing night parties book-end the festival and re-enforce BE FILM's commitment to community, artistry, and the development of invaluable networking opportunities and relationships. Be Film The Underground Film Festival - BTUFF is a New York City forum for independent filmmakers, worldwide, and celebrates the best short-form, cinematic expressions to hit the screens. Dedicated to championing great films for worldwide distribution, BE FILM is proud to screen its selected shorts in some of the best venues available today, including the Disney Park Avenue Screening Room, the Dolby Screening Room, and the Crosby Screening Room.